Black ferrous oxide or sludge can seriously reduce your boiler’s efficiency by reducing heat transfer or causing blockages in the boiler and pipework. 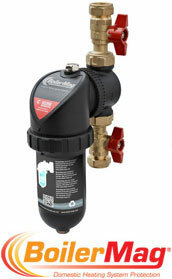 Most new build or refurbishment projects now specify a heating system filter. BoilerMag is a highly efficiency filter system which removes both harmful magnetic and non magnetic debris, such as recirculating lime scale, protecting your boiler and ensuring full thermal efficiency of boilers and radiators. BoilerMag is the latest innovation from Eclipse Magnetics, a world leader in magnetic technology. Using our wealth of experience in magnetic design and fluid flow we have designed a highly efficient filter. BoilerMag allows the installer to fit in minutes and have the reassurance the unit will have along trouble free operation. It’s all in the Box – everything you need is in the kit:no need to buy additional fittings or adaptors, simply measure cut and fit. Job Done! Cleans in Minutes – Maintenance and aftercare for the BoilerMag is simple and easy. Cleaning can be done in minutes following the simple instructions provided. Superior Collection Capacity – BoilerMag is design to ensure no blockages can occur and as an extra bonus it only requires cleaning during the annual heating system service. Long Lasting Components – With a healthy system you significantly increases the lifespan of boilers, radiators, pumps and valves. Reduced Energy Bills – With a cleaner and more efficient system you will improve performance so no more radiator coldspots or reduced boiler heat transfer. Significantly Increased Boiler Life – Its simple - a typical boiler and installation costs around £2000, why not protect it? Zero Running Costs – Once fitted BoilerMag required no replacement parts or consumable items. Reduced Energy Use – reduced system debris means increased heating efficiency. Reduced Carbon Emissions – reduced energy use means reduced CO2 emissions. No Consumables – requires no throwaway items to run and maintain. The evidence is all there, to ensure your boiler runs as effectively and efficiently as possible ensure your whole system runs smoothly with a BoilerMag.